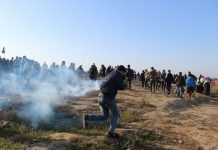 The Palestinian Center for Human Rights (PCHR) condemns that Gaza Ministry of Interior banned Dr. Zakariya al-Agha, Member of the Executive Committee of the Palestinian Liberation Organization (PLO) and Head of PLO’s Department for Refugee Affairs, from traveling to the West Bank today via Beit Hanoun (Erez) crossing, north of the Gaza Strip. PCHR calls upon the Ministry of Interior in Gaza to respect public freedoms and to stop all measures restricting the right to freedom of movement that is constitutionally guaranteed and ensured by the international human rights standards. According to media, Sa’id Salamah, Director of Studies and Media at the PLO’s Department for Refugee Affairs, highlighted that Dr. Zakariya al-Agha should have attended a meeting of the PLO Executive Committee in Ramallah in his capacity as the Head of PLO’s Department for Refugee Affairs. It should be noted that this is the second time in the same month that Dr. al-Agha is banned from traveling via Beit Hanoun (Erez) crossing. The security services in Gaza banned him on 19 May from heading from the Gaza Strip to Amman-Jordan to attend a conference of the UNRWA Consultative Committee and a coordination meeting of the Arab countries hosting Palestinian refugees. PCHR condemns the measures taken by the security services in Gaza, restricting the freedom of movement. PCHR further calls upon the competent authorities in Gaza to stop all these measures and respect the right to freedom of movement which is constitutionally guaranteed and ensured by the international human rights standards.